What’s it all about? Doodle 4 Google is an art contest meant to spark children’s curiosity and encourage exploration and creativity. The goal is to design a Google Doodle using this year’s theme as your guide: “If I Could Invent One Thing to Make the World a Better Place”. The contest is open for all children in grades K-12, and the prizes for the Grand Prize winner are inspiring: a $ 30,000 college scholarship, a $ 50,ooo technology grant to the winner’s school, a trip to Google’s headquarters to work with the Real-Life Google Doodlers, and… the best prize of all…wait for it… the opportunity for your Google Doodle to be THE Google Doodle, featured on the Google home page, for all the world to see. Click here to visit the Google 4 Doodle home page, learn more, download a submission form, and get started. Google does a truly fantastic job of helping parents and teachers to inspire their children’s imaginations. They provide online activity packs by age, containing inspirational quotes, brainstorming activities, stories about inventors, and guidelines for helping your children think outside the box. Click here to check out the online activity packs. 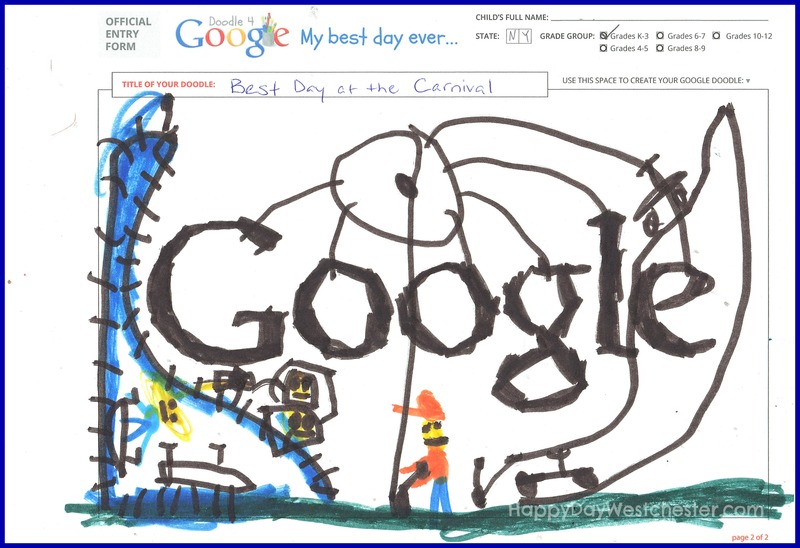 My own little artists participated last year, and were super-excited at the chance to grace the Google homepage. Here’s one of our entries, based on the theme “My Best Day Ever”. We may not have won, but the process was a great experience, and we are fired up to try again! And finally, if you love Google Doodles as much as I do…. Click here to see every Google Doodle posted by the Google Doodlers since 1998.